"Delicious" is the term most often used to describe these by guests, along with the phrase "Oh! They're warm." These are the first things I present to guests, along with my home made rosemary focaccia. Fabe or Etien put them out while I potch around making final menu checks. They are often all gone in the five minutes it takes me to gather my camera and present myself to the new party. "These are... were... my warm, spiced nuts." The best praise is an empty plate. My recipe is based on the Union Square Cafe dish that has been copied the world over. Mine is smokier with less chilli heat. I wanted to have something simple but different for diners; something that set the tone and standard of the restaurant as soon as they entered. The nuts go very well with a glass of wine or beer, of course. Take 100g mixed nuts. Now, I say mixed but I try to avoid Brazilian and pistachio and I favour walnuts and pecans. Brazils are just too big - the bully of the nut world, and pistachios are so far outside the flavour of the family - the crazy cousin. 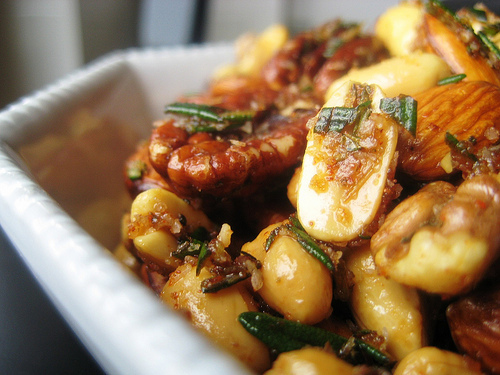 In an 180°C oven, heat the nuts on a baking tray for 8-10 minutes. You're looking for a slight change in colour but most importantly, a crispness. The time will vary on the type of nuts you're using. While the nuts are warming, prep the spice mix in a bowl. I use a mortar and pestle so I can grind everything to a powder. Personally I don't like big bits of rosemary (unlike the picture above - ahem). Add 1 heaped tablespoon of muscovado sugar and 1 level tablespoon of sea salt (important - NOT table salt. I always use Maldon) with 1 tablespoon of finely chopped, fresh rosemary. To this add a good few grinds of black pepper, a half teaspoon of smoked paprika and a knife tip of cayenne - more if you like heat. Add a good knob (maybe 25g) of butter to a pan a heat until it's just browning (beurre noisette). remove from the heat, add the nuts and coat with the brown butter. Allow to cool before adding the spice mix and stir thoroughly. Taste. You might want to add more salt. Beware any sticky lumps of spice mix; it's a brave person who swallows those. Although one guest did seem to seek them out.